So, I hate to admit that I am a bit behind on my book reviews that are part of the blogger review program for Bethany House Publishers, a well-respected publisher of Christian fiction and other Christian titles. Fortunately, they are extremely graceful, and for that, I thank them. But just because I am behind does not mean that I am not a fan of Nancy Mehl’s Inescapable or the next book I’ll review soon [with Ben’s help!]. 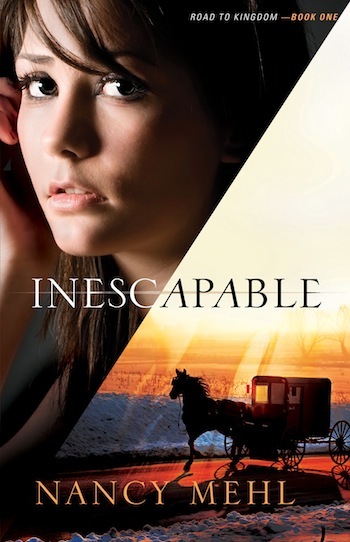 Lizzie Engel ran away from her Mennonite hometown and swore she’d never return. But five years later, a stalker and a string of threatening letters have left her with no other option. Back in Kingdom, Lizzie attempts to plan her next move with the help of her old friend Noah Housler—and realizes she may not have left her roots as firmly in the past as she’d thought. When it becomes clear that the danger has followed her to Kingdom, Lizzie no longer knows who to trust. This is the first Christian romance about Mennonites that I’ve ever read. I’ve read a lot of Amish romance novels [ha! so lame!] and found similarities between the cultures, but also differences. It was an educational read in that sense [don’t worry, it’s not school :)]. Reading about Lizzie’s growth in faith and learning a right view of God as a loving Father was so encouraging. There are several women who really minister to Lizzie as she returns home, and it was awesome to read about that grace, forgiveness, mercy, and redemption. Speaking of redemption, I don’t want to give any spoilers, but there is soooo much redemption taking place in this story, in Lizzie’s life, in her family. Absolutely love this! I know she isn’t real [gasp! ], but it’s an amazing illustration of what God can do in people’s lives. Overall, I thought this was a fun, interesting read. I love the dual romance/mystery nature of the book, and would definitely read more of Nancy Mehl‘s work, including the next book in the Road to Kingdom series [expected to be released spring 2013]. Wow this sounds great! I love a book that you just can’t put down. yes, those are the best kind!! Every book you review I want to read, I just wish they were more popular (not a failing of the books, but of the population who likes raunchy vs. godly stories) so I could get the audio version at the library. The seem to only carry the most popular books on CD. I’m still “reading” My Stubborn Heart…I stopped reading it months ago and still haven’t picked it back up! It’s crazy, I used to read a book without stopping from front to back…not so much any more. I think I’ve gotten lazy reading with my eyes since I mostly listen now. I do LOVE it and really want to know how this relationship will ever work (the girl just went out of town with Grandma and by the time she got back, the guy had regressed and was trying to stay away again–been so long I can’t even remember their names) but there’s just o much to do in a day I keep forgetting to pick it up. I think I’ve checked it out like 12 times now. LOL! aww, sad! well, i can’t listen to books (i just wind up thinking about other things)… to each her own, i suppose.